Crafted with hand-picked grapes from Italy’s most prestigious wine regions, Bivio Italia reveals Italy’s renowned winemaking tradition in its own refreshingly modern style. Winemaker Marco Galeazzo creates richly textured, elegantly balanced wines with an emphasis on eliciting full, fresh fruit flavors. His wines seamlessly integrate old and new world styles, the hallmark of Bivio Italia Wines. Red, made in the heart of Tuscany, showcase the rich fruit and earth characteristics of this famed region. Our DOCG Prosecco Spumante is sourced from the highly acclaimed Veneto region and our newest addition, Moscato d'Asti DOCG, is a lightly effervenscent and low-alcohol wine sourced from the hilltop town of Asti in the Piedmont region of northwestern Italy. 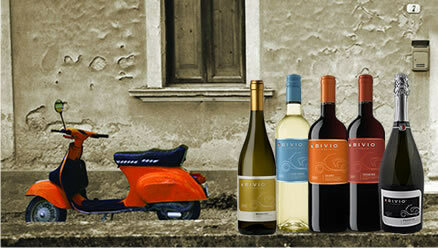 Like the scooter, a timeless Italian icon, Bivio Italia celebrates the vibrancy and spirit of both classic and modern Italy. Marketed by Bronco Wine Co. Please drink responsibly.